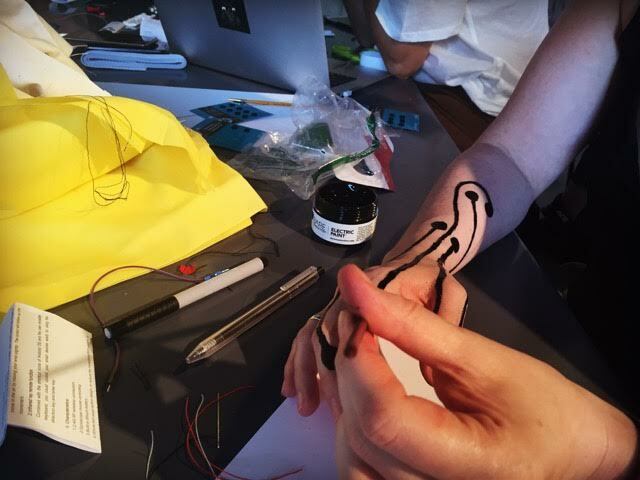 Turn Your Body Into an Interface Using Conductive Ink #WearableWednesday « Adafruit Industries – Makers, hackers, artists, designers and engineers! People have been experimenting with conductive body tattoos and flexible circuits, but Xin Liu’s recent workshop at Eyebeam, NY, really showed the interface possibilities. 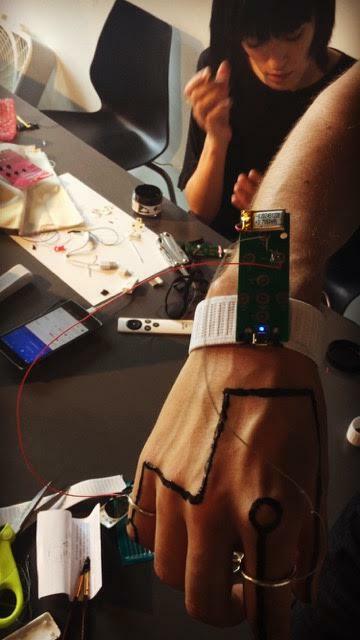 Participants painted circuits on their arms using Bare Conductive Ink and then connected the traces to the guts of an air mouse strapped onto the wrist with an elastic band. The idea was to create a human mouse using hand gestures, kind of like a more interesting version of Makey Makey. One participant put his jewelry to good use and managed to connect to his Android phone. Love that! Certainly an obvious challenge in this project is working with the paint, as it can take a bit of time to dry. However, Xin spoke of a more interesting issue. The interesting question is how can we connect the wires from PCBs to conductive ink on skin. Apparently we cannot solder. Glue is annoying and not stable. My idea is soldering the wire to a metal snap which is sewed on the elastic band. The strength of the elastic band secures the contact between the snap and skin, where we paint the contact area with conductive ink. There’s nothing like a problem to stir up some idea generation. I know I was already wondering if conductive fabric would be helpful since it is soft on the skin, however, Xin thinks that the resistance may be too high. What is really needed is something like the flexible caulk found in a bathtub, only conductive. Can someone invent that already? 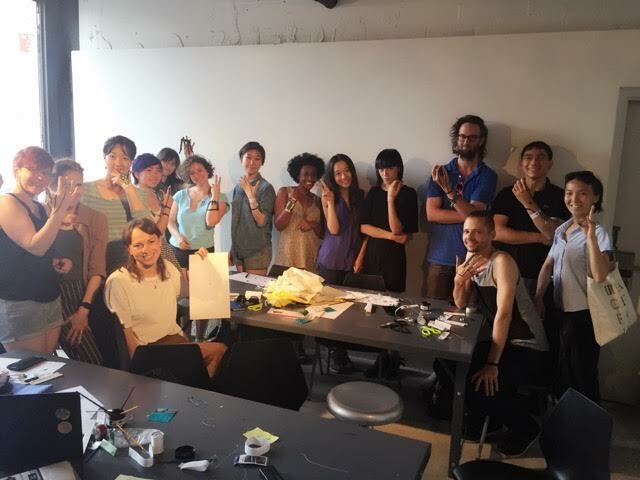 Regardless of the products that still need to be invented, this was another awesome wearables class at Eyebeam. Their special combination of tech and art was what got me started in hacking a long time ago. Sending a “woot” to this particular class and wishing them even more success as they perfect their human circuits at home. 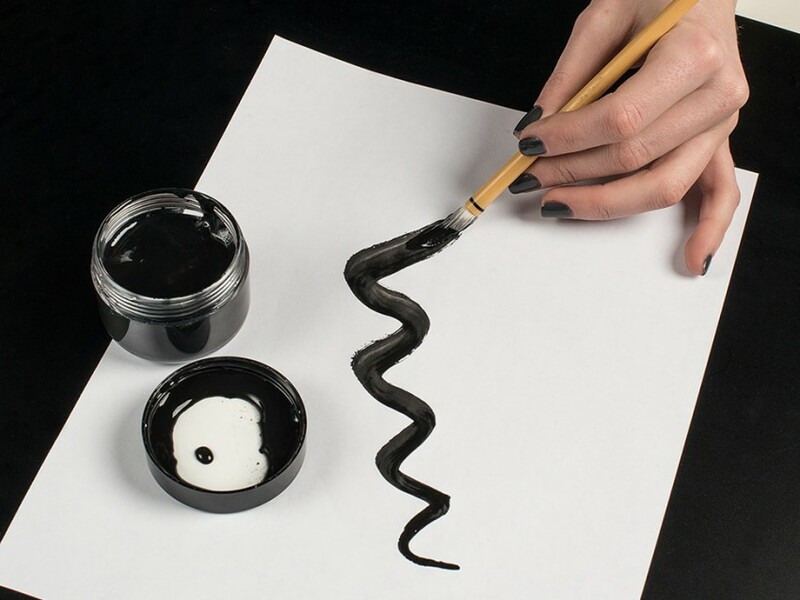 Feel like you want to get your hands on some conductive ink? Well, we’ve got it. In fact, Bare Conductive comes in a smaller tube/pen size or a larger container. FYI this is non-toxic, so you can play with the kids, too. Send us a video of the human interface you develop!